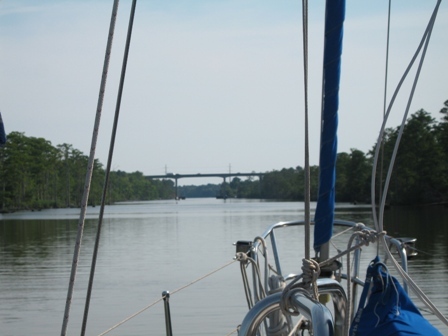 The Intra-Coastal Waterway (ICW) is a series of interconnected rivers, canals, and sounds that stretches from Norfolk, Virginia to Key West Florida. 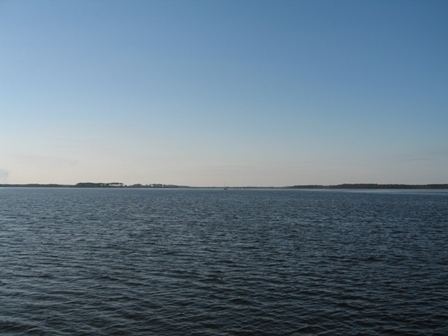 The plan for the ICW was initially conceived over 200 years ago. 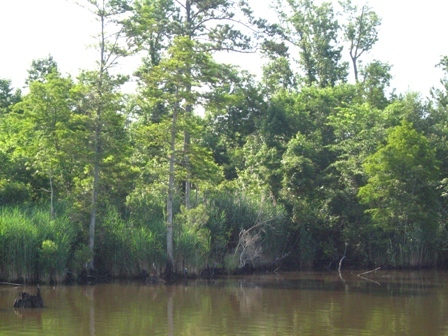 The Dismal Swamp Canal in Virginia was ordered by George Washington, and hand dug by slaves. 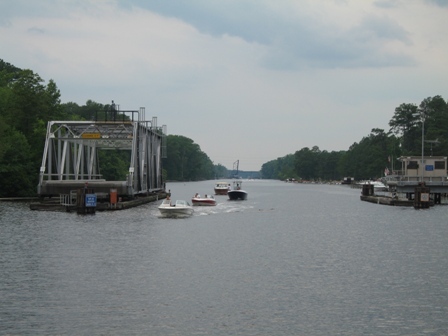 It remains the oldest continually operating canal in the US today ("Managing the Waterway"-Mark and Diana Doyle) The Albemarle & Chesapeake Canal was initially surveyed in 1772, and finally completed in 1859. 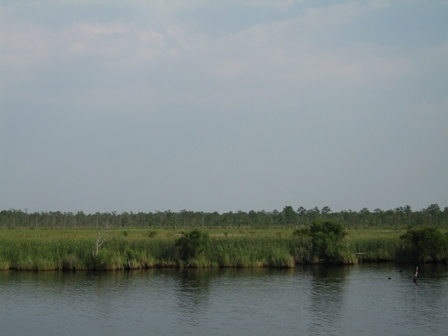 It was the development of the steam shovel, that made it a practical reality to dig through swamps and marshes, in order to link the waterways. It was in part the threat to shipping of German U-boats off the coast during WW II, that lead to the completion of the ICW. 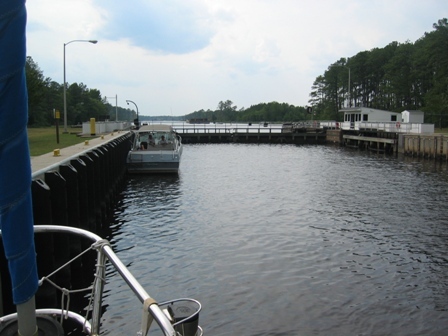 It is currently managed by the Army Corps of Engineers, who oversees the periodic dredging to keep the water ways open. 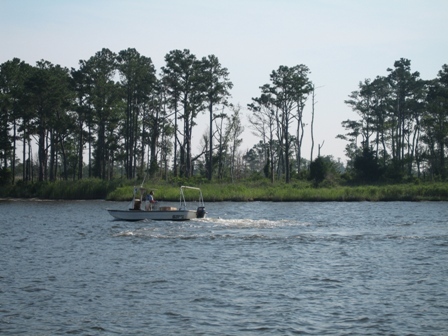 The ICW through North Carolina has been especially popular, as it keeps boats from having to travel offshore around Cape Hatteras. This is an area infamous for its frequent storms, and ubiquitous sandbars, which cause steep treacherous seas, earning it the name "Graveyard of the Atlantic". This seemed like a good enough reason for us to venture into the ICW instead. 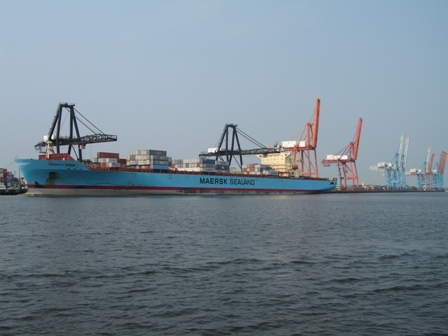 It is due to the dangerous shoreline of North Carolina, that the state never prospered during the shipping boom that brought fortune to so many other coastal cities. 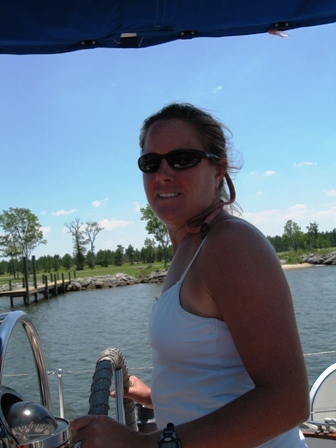 Before leaving Beaufort, NC to travel along the ICW to Norfolk, Virginia, Marco and I decided that it would be a piece of mind to contact Boat US and add unlimited towing to our membership. The policy didn't go into effect until midnight that night, however, so we hoped that we would not ground before then. A towing for a soft grounding is estimated at $500, which compared to a $100 unlimited towing insurance makes for easy math. 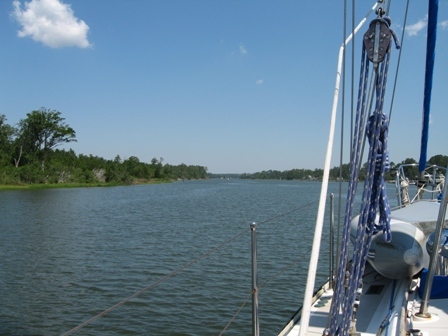 Our manual "Managing the Waterway" was full of sound advise, and relayed the joke that there were two kinds of boats on the ICW, those that are aground, and those that will soon be aground! 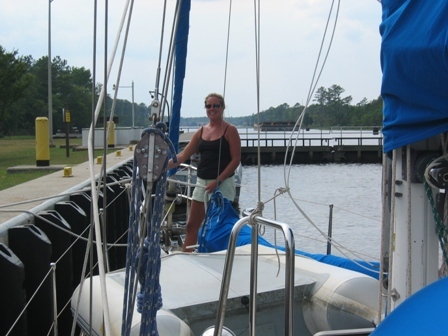 Here we are entering the ICW after leaving Beaufort. 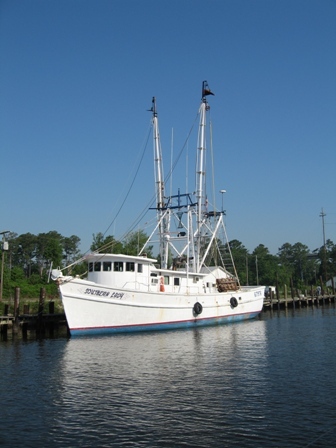 In this section of the ICW dolphin were frequently seen off our bow. 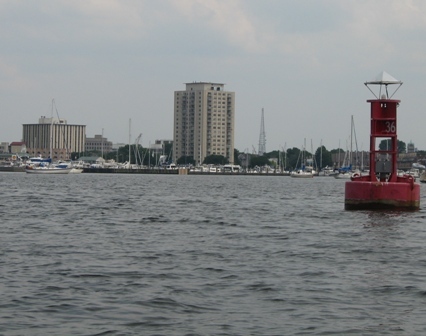 This is an example of the mile markers that are dispersed every 5 statute miles along the ICW. Before many of the fixed bridges there were bridge clearance markers that showed how much clearance was available. 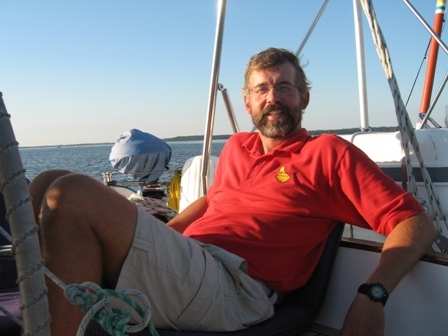 Marco relaxing once we dropped anchor at Bonner Bay after our first day on the ICW. 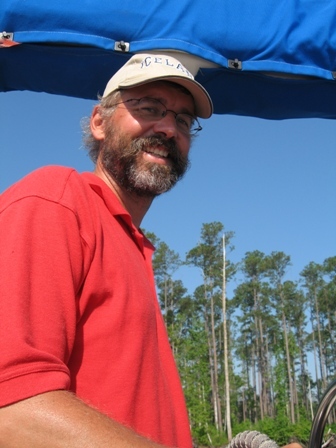 In the ICW the water was a dark rich brown in color. It looked like a cup of strong tea or coffee. 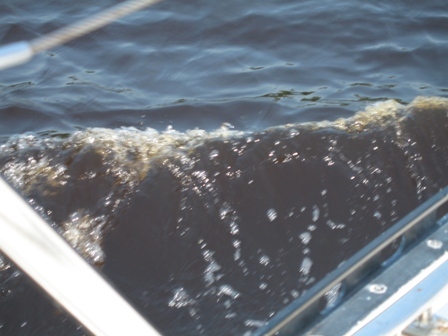 Like the substance that colors coffee and tea, tannin is also the substance that makes this water brown. 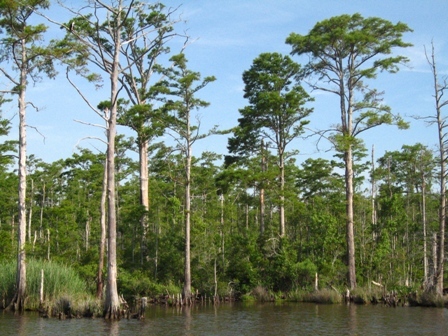 Tannin is naturally released from the roots and decaying leaves of cypress and juniper trees that line the shores of the ICW in North Carolina. Even though the water looked dirty it actually wasn't. In the old days sailing ships actually sought out water with tannin because it wouldn't spoil as quickly due to the acidity of the water. Tannin does stain fiberglass however, so in addition to the growth on our waterline now we have an ICW-moustache. 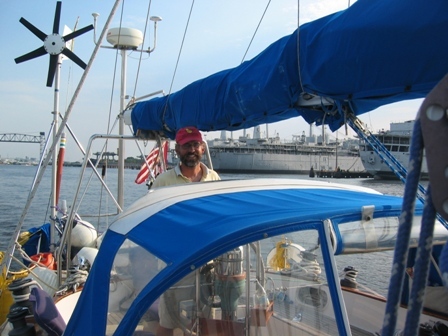 Captain Marco at the helm. 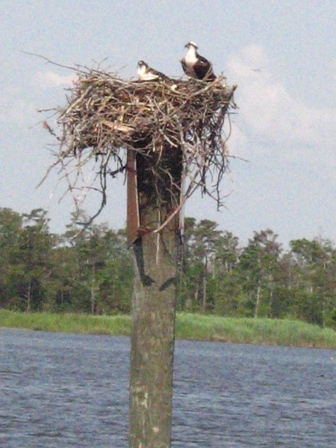 There were many Osprey nesting on mile markers and aids to navigation along the way. We were even treated with seeing a Bald Eagle. 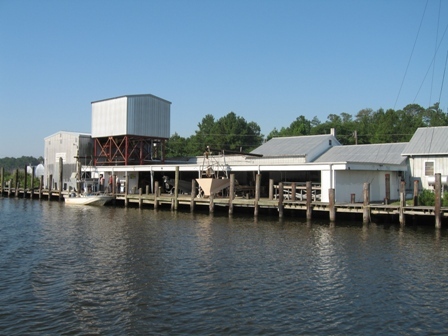 The working shrimp dock at R.E. 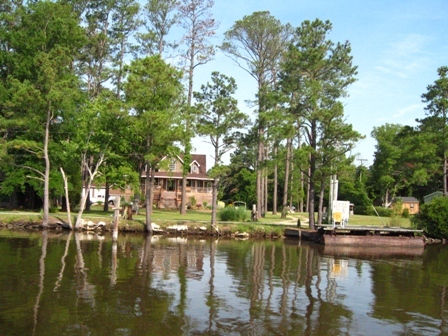 Mayo located in Hobucken, NC along the ICW. 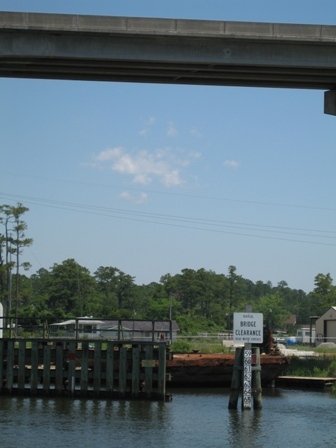 Some of the different boats we encountered along the ICW. 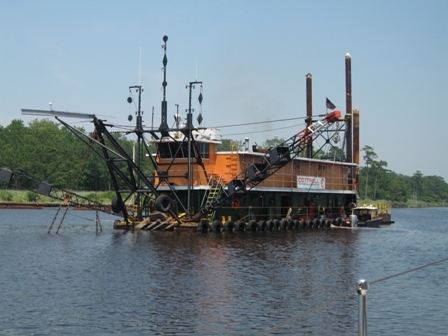 This is a dredger that we motored by that was also laying pipe in the ICW. 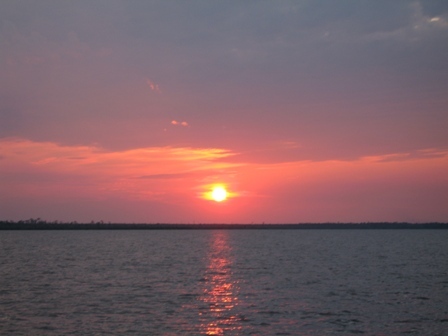 Second night at anchor with the amazing sunset at Whipping Creek anchorage mile marker 100. 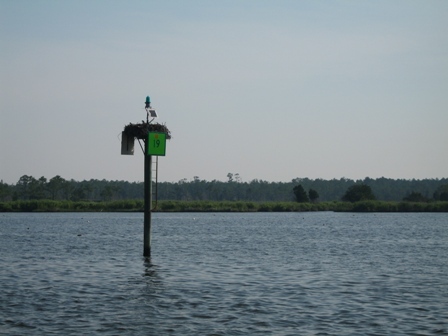 Another Osprey nest on an aid to navigation. 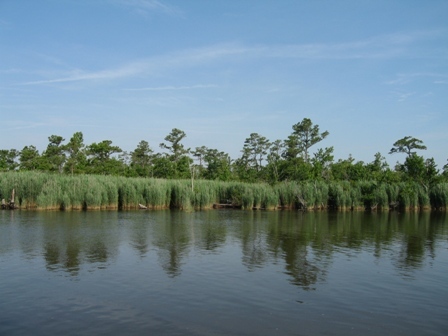 The shore line changed from swampy to wooded with Bald Cypress, Loblolly Pine, Holly and Juniper. 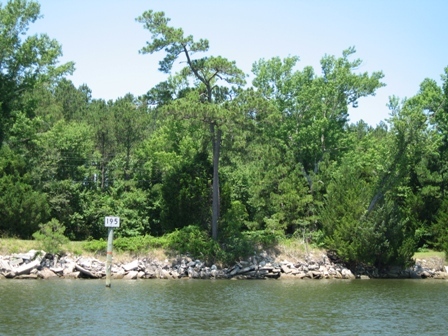 There were also areas where homes lined the shores of the ICW. The entire ICW is not just a canal. 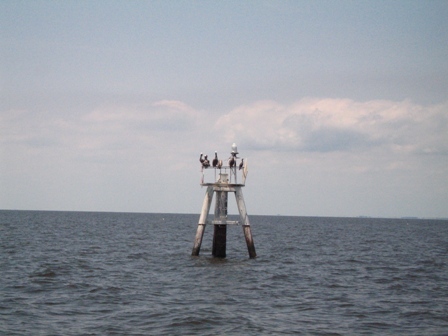 This is Albemarle Sound (mile marker 69.4) which was a 15 mile stretch of shallow open water we had to cross along the way. 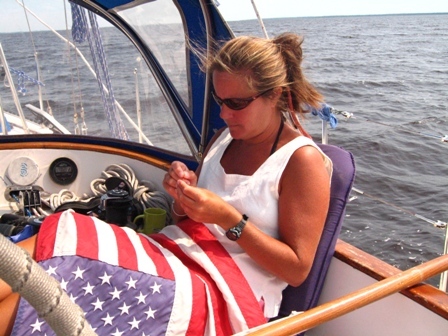 I decided I needed to mend our flag that we have been flying since we left Rhode Island in May of 2006. We plan on framing it once we get home as a souvenir of our Circumnavigation of the North Atlantic. Examples of different bridges we came across. 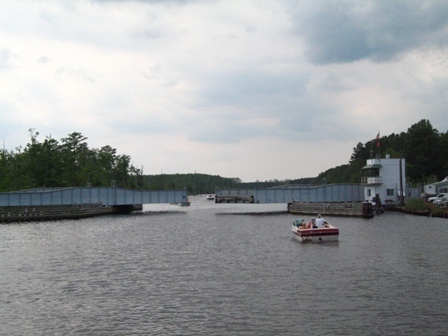 The lift and swing bridges either had a fixed opening schedule or you hailed the bridge operator and asked him/her to open the bridge for you. 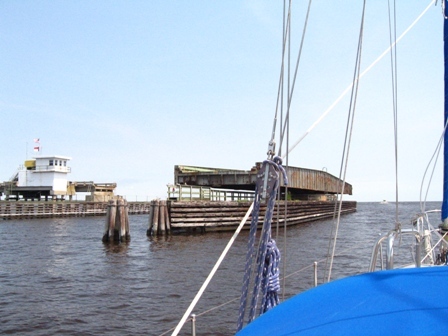 These are the rail road bridges before traversing Norfolk's commercial harbor. 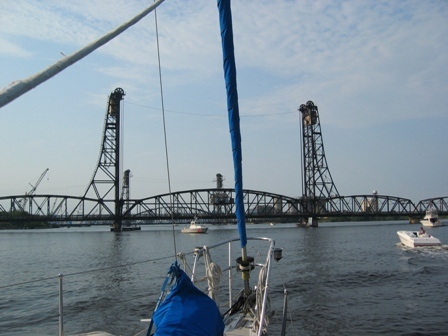 These bridges lifted with massive counter weights sliding down vertical rails. 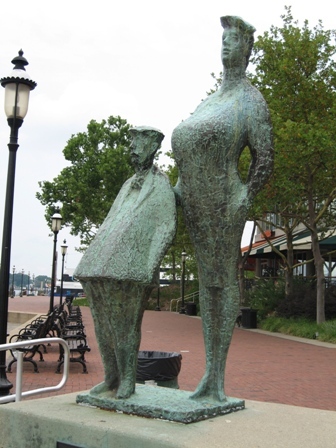 Marco and I entering Norfolk, Virginia. 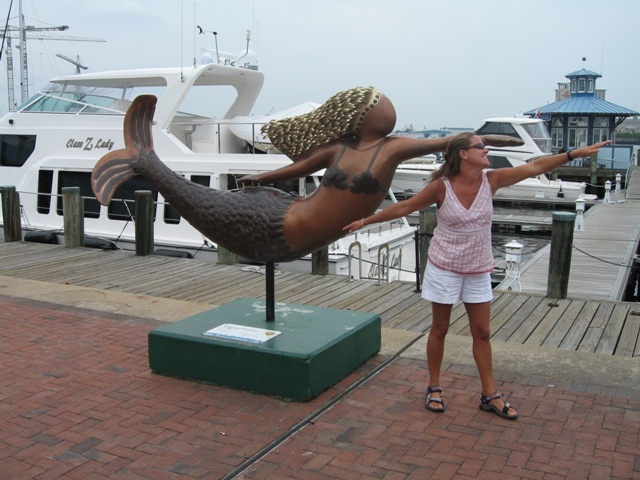 Norfolk has a fun and vibrant waterfront area, with several restaurants, and interesting parks. 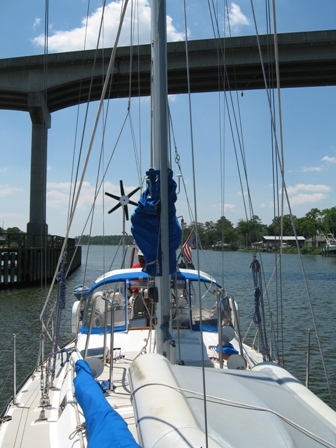 Red Nun 36 in Norfolk, is mile marker zero of the Intra Coastal Waterway. 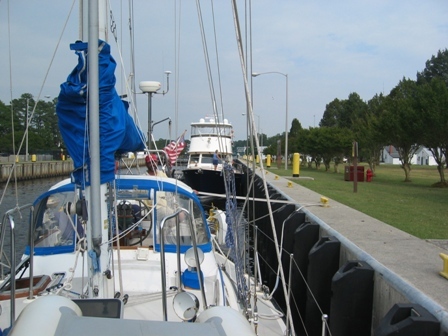 Dalliance is anchored on the left. 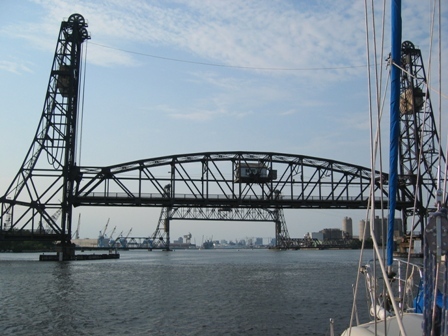 Norfolk and Portsmouth have been major centers for naval and commercial shipping for centuries, with Portsmouth being the nation's biggest and oldest. 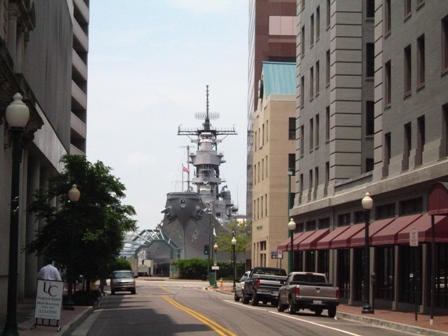 Even on a stroll through downtown Norfolk, the Navy's presence can't be missed. The 900-foot battleship Wisconsin looms large. 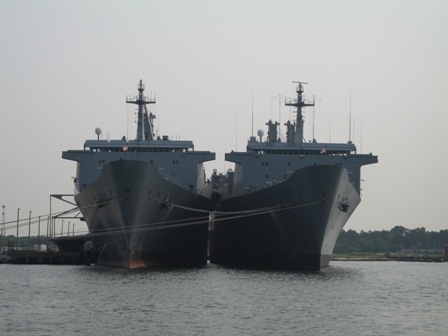 Twins at the Naval Shipyard in Norfolk. 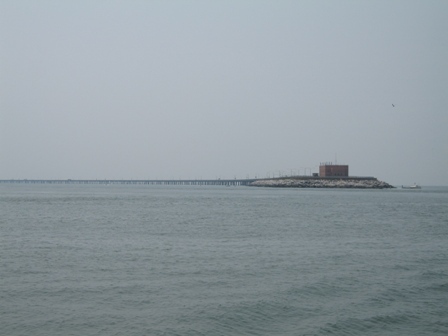 Looking back at the Chesapeake Bay Bridge-Tunnel gives some perspective to the vast size of this engineering marvel completed in 1964. 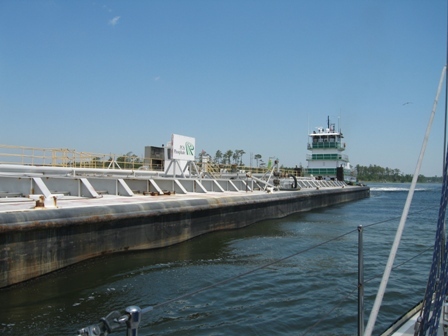 Part bridge, and part tunnel to allow the unencumbered passing of large shipping, it spans a total of 17.6 miles, and cuts off 100 miles from driving from the Hampton Roads area to points north of the Chesapeake Bay. As we were heading back out to sea from the Chesapeake Bay we saw hundreds of dinner plate sized immature manta rays swimming into the bay just below the surface.